For as long as there have been monsters who stalk the shadows and misuse mortals, brave men and women have stood against the darkness - or walked beside it. Some call on the power of Heaven and their faith, some study the mystical paths, some search through ancient tomes, some wield the resources of their governments, and the rest have only their knowledge, their courage and their hope. Will it be enough? 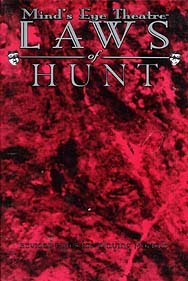 Laws of th Hunt Revised contains all the material that players and Storytellers alike can use for creating, playing and Storytelling mortal characters - from the members of the Inquisition and Arcanum, to enigmatic sorcerers and psychics, to soul-deadening Autumn People. Here are systems specific to mortals, from spirit summoning to sickness. Here, at last, is your chance to take back the night.